Why Do All Election Forecasters, Political Scientists, Academics and Media Pundits Avoid the Systemic Fraud Factor? It’s about time that the so-called experts who promote overly complex or overly simplistic pre and post election models started to apply the scientific method. They need to do a robust probability and statistical analysis, including the election fraud factor in historical regression factor analyses and polling models. Election forecasters and political scientists implicitly assume that the recorded vote is equal to the True Vote; they never consider Systemic Election Fraud. But the recorded vote is never equal to the True Vote. The proof is simple and self-explanatory. According to the US Census, there were 80 million more votes cast then recorded in the 1968-2008 presidential elections. The uncounted votes were a combination of spoiled, provisional and absentee ballots. And the vast majority (70-80%) of them were, not surprisingly, Democratic. Therefore, the recorded vote has never represented the will of the electorate. And the historical election data that is accepted as conventional wisdom is based on uncounted and miscounted votes. Media pundits and political scientists never question the unscientific and faith-based practice of forcing the exit polls to match the recorded votes. Even when the adjustments are mathematically impossible. Historical evidence indicates that since 1988, Democratic presidential vote shares are always reduced by 3-5%. The Democrats won the average unadjusted state exit poll aggregate by a massive 52-42% margin, but their recorded vote margin was just 48-46%. The True Vote Model confirms the exit polls. The TVM indicates that they won by 53-41%. There were comparable deviations in senate, congressional and gubernatorial elections. Unadjusted exit poll and recorded vote data is provided in 1988-2008 State and National Unadjusted Exit Polls. The data source is the Roper UConn Center site. Prior to 2004 the exit poll discrepancies were primarily due to uncounted ballots in heavily Democratic districts. But the 2002 Help America Vote Act (HAVA) resulted in the installation of thousands of unverifiable, proprietary voting machines vulnerable to computer hacking and malicious coding. It is often stated that exit polls were accurate in elections prior to 2004 and have deviated sharply from the recorded vote since. That is a canard. State and national UNADJUSTED EXIT POLLS ARE ALWAYS ADJUSTED to match the RECORDED vote. That’s why they APPEAR to have been accurate. RECORDED votes have deviated sharply from the UNADJUSTED exit polls (and the TRUE VOTE) in EVERY election since 1968. UNADJUSTED exit polls have ALWAYS been quite accurate to within a 1-2% margin of error and closely matched the True Vote Model in each of the 1988-2008 elections. The reason FINAL state and national exit poll matched the RECORDED vote was because they were FORCED to do so. It’s standard policy on the part of the pollsters. But the recorded vote has NEVER reflected true voter intent due to UNCOUNTED and STUFFED ballots and MALICIOUSLY programmed electronic voting machines. Let’s see how the 2004 National Exit Poll was forced to match the recorded vote. 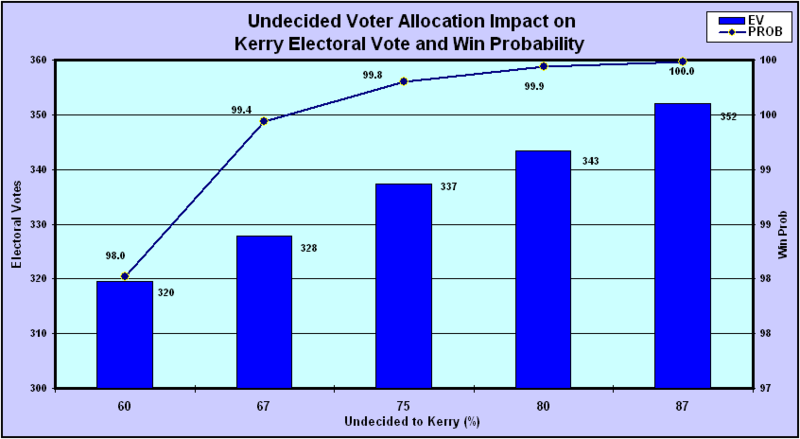 Kerry won the state exit poll aggregate (76,000 respondents) by 51.1-47.5% (3.6% margin). The NEP was adjusted to match the recorded vote by assuming nearly 6 million more returning Bush 2000 voters than were alive in 2004. Here is the proof: The 2004 National Exit Poll (NEP) is a subset of the state polls. 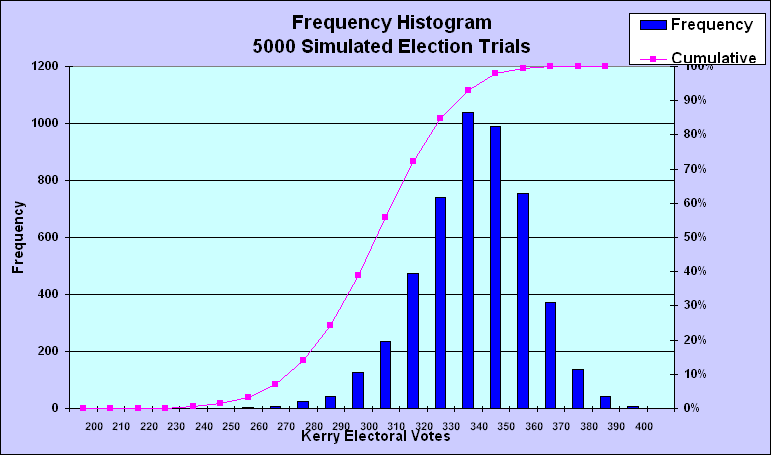 The unadjusted NEP showed that Kerry won by a 4.8% margin. Bush had 50.5 million recorded votes in 2000. Approximately 2.5 million died, so at most there were 48 million returning Bush voters – but not all returned to vote. Assuming 98% of living Bush 2000 voters turned out in 2004, then there were 47 million returning Bush voters (38.4% of 122.3 million 2004 voters). But according to the adjusted NEP, there were 52.6 million returning Bush voters (43% of the voters). There is a major disconnect here; we have just shown that there were approximately 47 million. So where did the 5.6 (52.6-47) million Bush voters come from? The bottom line: In order to adjust the National Exit Poll to conform to the recorded vote, there had to be 5.6 million phantom Bush voters. Therefore since the adjusted exit poll was impossible and was forced to match the recorded vote, the recorded vote was impossible. Let’s now consider how two National Exit Poll categories were adjusted to match the recorded vote. 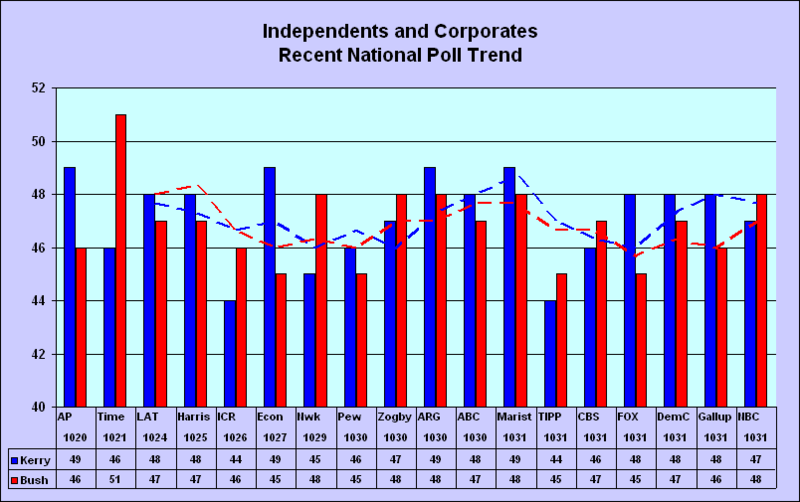 1) Bush Approval – Eleven (11) final national pre-election polls gave Bush a 48% approval rating. The unadjusted state exit poll aggregate (76,000 respondents) indicated that 50.3% approved. But in the adjusted Final National Exit Poll, Bush approval was increased to 53% to force a match to the recorded vote. 2) Party-ID – The unadjusted state exit polls indicated a 38.8-35.1-26.1% Dem/Rep/Ind split. The adjusted 2004 National Exit Poll had an impossible 37-37-26%. Consider that in 2000, the Party ID split was 39-35-26%. But the vast majority of new 2004 voters were Democrats. The 37-37-26% was a fudge to force a match to the recorded vote. In the 1988-2008 presidential elections, 135 of 274 unadjusted state exit polls exceeded the margin of error. The probability is ZERO. The largest discrepancies occurred in 2008 (the MoE was exceeded in 37 states). Of the 135 exit polls that exceeded the MoE, 131 red-shifted to the Republican. The probability that this was a random occurrence is ZERO. The one-sided red shift from the exit polls to the vote is proof beyond any doubt of systemic election fraud. The experts and pundits claim that likely voter (LV) pre-election polls have been very accurate in matching the recorded vote. But they don’t tell you that votes are miscounted in every election. Or that their predictions failed to include the majority of newly registered Democratic voters who did not pass the Likely Voter Cutoff Model (LVCM) screen. They also claim that registered voter polls (RV) don’t reflect actual voter turnout. That is only partially true; not all registered voters turn out. But they don’t tell you that predictions based on RV polls (after allocating undecided voters) closely matched the unadjusted exit polls in 2004, 2006 and 2008. – Raw precinct exit poll data has never been released. Voter confidentiality is a non-issue. – Exit polls are always forced to match the recorded vote even if the adjustments (i.e. returning voter mix) are physically and mathematically impossible. – 19 states are no longer exit polled. – 135 of 274 exit polls exceeded the MoE. Probability ZERO (14 expected). – Voting machines are rigged to switch votes with proprietary coding. – 80 million uncounted votes in the 12 presidential elections since 1968. – 11 million uncounted votes in 1988 may have cost Dukakis the election. – 6 million uncounted votes cost Al Gore the 2000 election. – Unadjusted exit polls show that the 1988, 2000 and 2004 elections were stolen. – 2004 NEP required 6 million phantom Bush 2000 voters (110% turnout). – Democratic landslides were denied in 2006, 2008, 2012. – Obama had 61% in the 2008 unadjusted National Exit Poll and a 52.9% recorded vote. – Obama had 58% in the 2008 unadjusted state exit polls and a 58% True Vote. – In 2012, Obama led 50.3-48% on Election Day (117 million votes); he won 12 million late paper ballot votes by 58-38%. Votes were stolen on voting machines. – Senate and Governor races were likely stolen in 2010. – Media pundits only discuss non-existent Voter Fraud. – The LV subset of RV pre-election polls always understates the Democratic vote. But they talk about voter suppression as if it is the only problem that needs to be addressed. Demographic trends based on bogus, adjusted NEP crosstabs which all understate the Democratic vote. They claim that in the 2006 midterms, the Democrats won the House by 52-46% (230-205 seats). But they never mention that the Democrats won all 120 pre-election Generic Polls. The trend line predicted a 56.4% share – exactly matching the unadjusted National Exit Poll. Approximately 20 House seats were stolen (primarily in FL, OH, NM and IL). The landslide was denied. 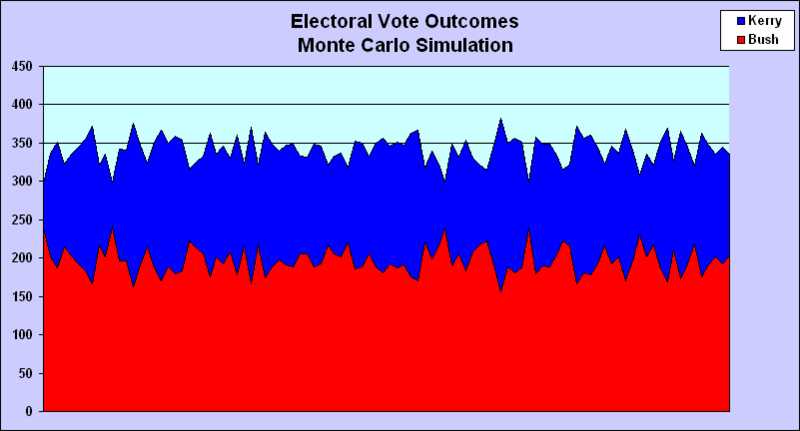 They claim that the 2008 pre-election LV polls predicted Obama’s 52.9-45.6% recorded share – a 9.5 million vote margin. But they don’t tell you that RV polls projected that he would win by 57-41%. Or that he had a 58.0% unadjusted state exit poll aggregate share – a 22 million vote margin. Or that he had a massive 61% in the unadjusted NEP (17836 respondents). They don’t mention that in order to match the recorded vote, the Final 2008 NEP required a 103% turnout of living Bush 2004 voters – or 12 million more returning Bush than Kerry voters. Or that the Final indicated there were 5 million returning third party voters – even though only 1.2 million were recorded in 2004. They fail to question the 2010 midterms. The Democrats easily won the unadjusted Governor exit polls in Florida and Ohio – but lost the elections. Giannoulias won the Illinois Senate exit poll – and lost the election. Sestak lost in Pennsylvania after leading in the exit polls. They never discuss the evidence which proves that Obama’s 2008 True Vote was reduced by a 5% fraud factor. Considering that the 1988-2008 average Democratic True Vote margin was reduced from 10% to 2% by election fraud, Obama needs 55% just to break even in 2012. He needs another landslide to overcome the fraud factor. – Use votes cast in their analysis (i.e. stipulate uncounted votes). 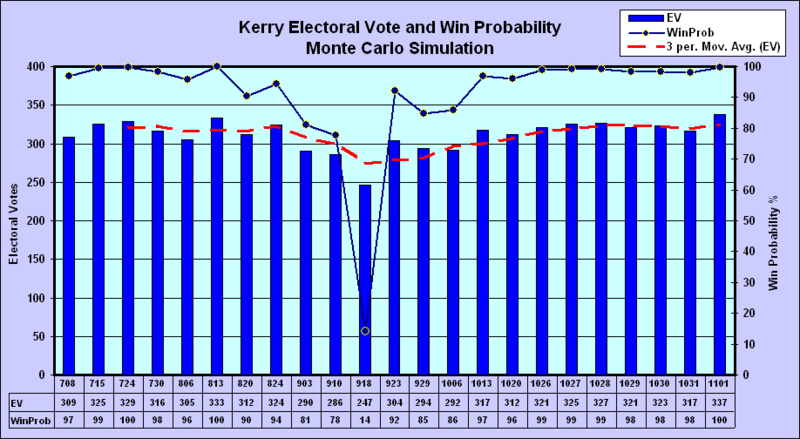 – Employ reasonable forecast assumptions using both RV and LV polls. – Indicate that LV polls are a subset of RV polls. – Note the Likely Voter Cutoff Model’s built-in bias against new voters. – Allocate undecided and uncounted votes. – Use voter mortality rates before estimating new and returning voter turnout. – Use correlation analysis: exit polls, approval ratings, Party-ID. – Question why exit polls are always forced to match the recorded vote. – Question why the NEP indicates more returning voters than are living. – In 1988, Dukakis won the unadjusted National Exit Poll (11,645 respondents) by 49.6-48.4% (11,645 respondents). He won the exit polls in the battleground states by 51.6-47.3%. But Bush won by 7 million recorded votes. There were 11 million mostly Democratic uncounted votes. – In 1992, Clinton won the unadjusted state exit polls (54,000 respondents) by 18 million votes (47.6-31.7%). He won the unadjusted National Exit Poll (15,000 respondents)by 46.3-33.4%. He had 51% in the True Vote Model (TVM). But his recorded margin was just 5.6 million (43.0-37.5%). The Final National Exit Poll (NEP) was forced to match the recorded vote. It implied a 119% turnout of living 1988 Bush voters. There were 10 million uncounted votes. The landslide was denied. – In 1996, Clinton won the unadjusted exit polls (70,000 respondents) by 16 million votes (52.6-37.1%). His recorded margin was 8 million (49.2-40.8%). He had 53.6% in the TVM. The Final National Exit Poll (NEP) was forced to match the recorded vote. There were 10 million uncounted votes. The landslide was denied. – In 2000, Gore won the unadjusted state exit polls (58,000 respondents) by 6 million votes (50.8-44.4%). He had 51.5% in the TVM. He won the recorded vote by just 540,000. There were 6 million uncounted votes. The election was stolen. 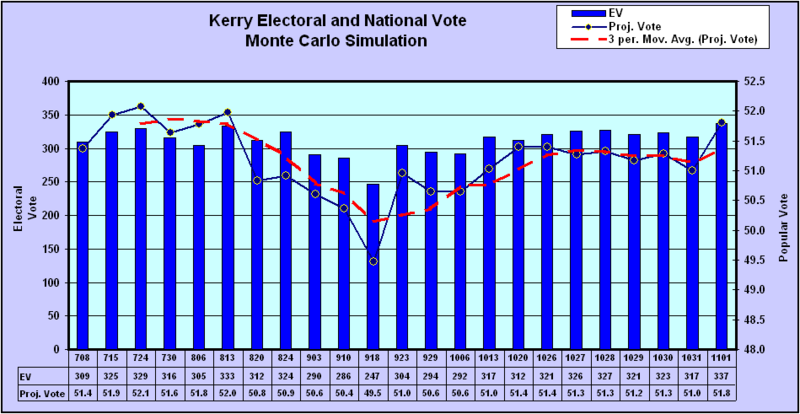 – In 2004, Kerry won the unadjusted state exit poll aggregate (76,000 respondents) by 51.1-47.5%. He won the unadjusted National Exit Poll (13,660 respondents) by 51.7-47.0%, a 6 million vote margin. He had 53.6%, a 10 million vote margin, in the True Vote Model But he lost by 3.0 million recorded votes. There were 4 million uncounted votes. The election was stolen. – In 2008, Obama won the unadjusted state exit poll aggregate (83,000 respondents) by 58.0-40.3%, a 23 million vote margin – a near-exact match to the TVM. He won the unadjusted National Exit Poll (17,836 respondents) by a whopping 61-37%. Officially, he had 52.9% and won by 9.5 million votes. The landslide was denied.